Those who went on strike protested around New York City and Philadelphia wearing red. These workers are responsible for maintaining and repairing landlines and installing FIOS so this strike will only affect customers who are looking for something to be installed or repaired to their service. Verizon is not going to let this strike affect their customer service therefore, new managers and retirees have been trained while they hope that this strike does not last as long as the one that occurred in 2000 which had a duration of nearly three weeks. 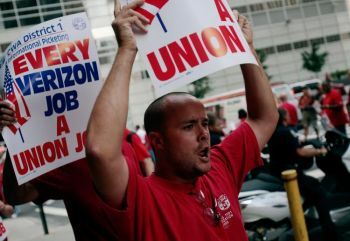 Verizon said they will sit back at the table and negotiate again only if the unions will bargain seriously.